The image comes from NASA’s Eyes on the Solar System app, which uses real-time telemetry from the spacecraft to depict an accurate representation of the goings-on of NASA’s spacecraft that are out and about in the solar system. I dabbled with this app before, but I’m looking forward to keeping tabs on Juno at Jupiter, Cassini at Saturn, and New Horizons in the Kuiper Belt, among other things. I should probably think about using this in the classroom because why the hell not? A huge congrats to the folks at NASA JPL and Lockheed-Martin for executing a perfect orbital insertion maneuver. They make it look easy, but it takes a hell of a lot of work. 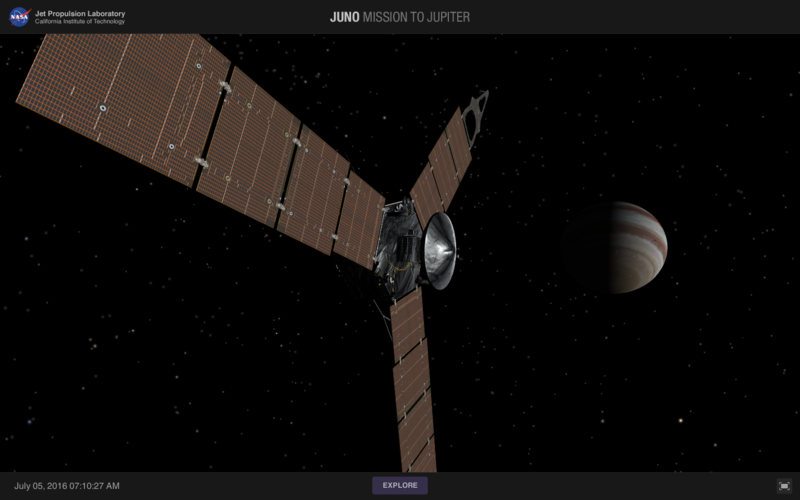 You can keep up with the mission at NASA’s Juno website, but if you loves some telemetry, get the Eyes app.